For centuries the Congo River has played a key role in trade, travel, and exploration in equatorial Africa. The Congo and its many tributaries form the largest system of navigable waterways in Africa. For local peoples, the river is a vital highway of commerce and communication. 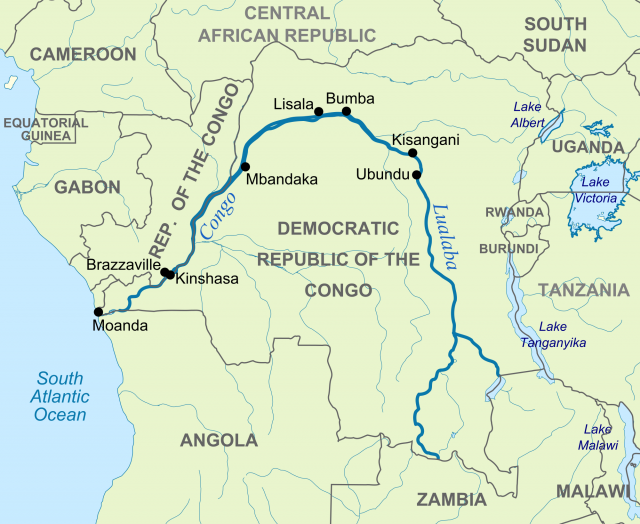 The Congo flows for 2,900 miles in a great curve through the center of Africa. It is the world’s second most powerful river (after the Amazon in South America), emptying 10 million gallons of water each second into the Atlantic Ocean. Together with its many tributaries, it drains a vast area that covers most of the nations of Democratic Republic of Congo, Republic of Congo, and the CENTRAL AFRICAN REPUBLIC. It also drains parts of ZAMBIA, ANGOLA, and TANZANIA. Much of the river lies within the cuvette centrale, a vast, basinlike depression in the plateau of equatorial Africa. The Congo’s main tributaries include the Aruwimi, Ubangi, Lulonga, Tshuapa, Sangha, and Kasai Rivers. The Congo is called the Lualaba at its source in the savannas near the southeastern corner of the Democratic Republic of Congo. It flows north over many falls and rapids to Wagenia Falls, not far from the city of Kisangani in the heart of the rain forest. Below Wagenia Falls the river’s name changes to Congo. Dotted with countless islands, it follows a lazy curve west and then south through the rain forest. In some places the river is more than 9 miles wide, and during periods of high water it spills over its low banks onto wide floodplains on either side. Below the city of Liranga, the river forms the border between the two Congo nations. At Tchumbiri, the river leaves the swampy flatlands of the cuvette centrale and begins carving a path to the ocean through the Téké Plateau and the Crystal Mountains. It narrows and flows rapidly between steep banks, then widens again to form Malebo Pool, also called Stanley Pool. On either side of the pool stand the two capital cities, KINSHASA (The Democratic Republic of Congo) and BRAZZAVILLE (the Republic of Congo). Between Kinshasa and Matadi, the Congo drops steeply, passing over 32 waterfalls. This section of the river could be the largest source of hydroelectric power in the world, although little has yet been done to harness that power. For its final 150 miles, from Matadi to the Atlantic coast, the river is navigable by oceangoing ships. The Congo’s waterfalls and rapids kept Europeans out of the central basin during the years of the SLAVE TRADE. So little was known of the river that as late as the 1800s Europeans thought that its mouth might be the mouth of the Niger River, far to the north. The upper Congo was familiar, however, to African fishers and traders, who traveled the river in very long dugout canoes with as many as 60 or 70 paddlers. France and Belgium sought control of the Congo River while they were establishing their colonies in equatorial Africa. The European scramble to colonize the area was started by Henry Morton STANLEY, the first white explorer to travel most of the river’s length. Early colonists transported steamboats piece by piece from the river’s estuary to Stanley Pool. Once assembled, the boats were used to control commerce and impose colonial rule on the central stretch of the Congo. Later, railroads carried people and goods from the coast to the steamboat networks.